A stray shower or thunderstorm is possible early. Cloudy early with some clearing expected late. Low 41F. Winds WNW at 10 to 15 mph..
A stray shower or thunderstorm is possible early. Cloudy early with some clearing expected late. Low 41F. Winds WNW at 10 to 15 mph. The 2018 District 9 Junior High Wrestling Championships were held on Saturday at Brockway High School. The champions are Curwensville’s Damian Brady (75), Port Allegany’s Dayton Sherwood (80), Chase Weimer (85), and Ian Dynda (100), Clarion’s Owen Reinsel (90), Brookville’s Brayden Kunselman (95), Cohya Brown (105) and Bryce Rafferty (155), Kane’s Harley Morris (110), Dakota Neal (210) and Shawn Nystrom (250), Johnsonburg’s Kaden Dennis (115) and Aidan Zimmerman (138), Brockway’s Connor Ryckman (122) and Dustin Flinn (145), Redbank Valley’s Kristopher Shaffer (130) and Ray Shreckengost (185), and Coudersport’s Dylan Hajzus (165). 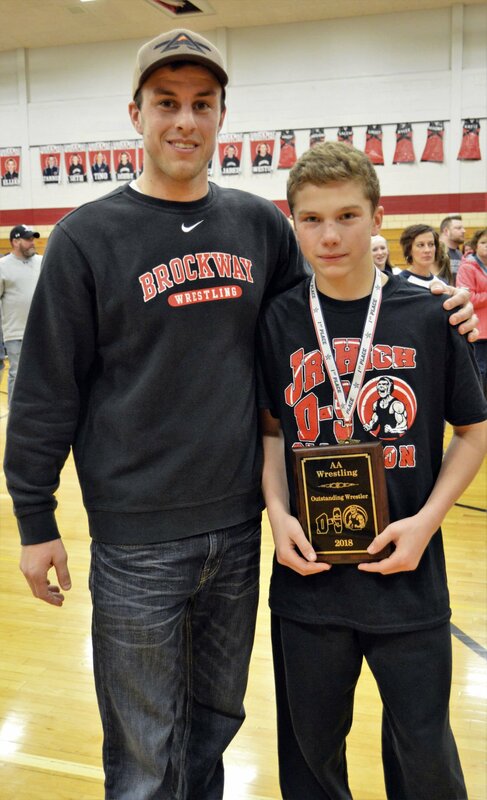 Brockway’s Connor Ryckman (right) was named the outstanding wrestler at the District 9 Junior High Championships on Saturday. Presenting the award is Brockway varsity wrestling coach Eric Grecco. Brookville’s Andy Viglione (left) and Brockway’s Eric Lunger tied for the District 9 Junior High Wrestling Coach of the Year at Saturday’s D-9 Championships. BROCKWAY — The District 9 Junior High Wrestling Championships were held at Brockway High School on Saturday, with the Tri-County area getting 11 champions crowned out of 18 weight classes. Brockway had two champions on the day, including the outstanding wrestler of the tournament in Connor Ryckman at 122 pounds. Ryckman picked up a major decision in the quarterfinals and a decision in the semis before picking up a 15-0 technical fall win over Brookville’s Jackson Zimmerman in the championship match. Dustin Flinn was the other champion for the Rovers at 145 pounds. Flinn had a bye in the quarterfinals before getting a first period pin in the semis. He defeated Johnsonburg’s Cameron Marciniak, 5-3, in the finals. Brookville had three champions in Brayden Kunselman (95), Cohya Brown (105) and Bryce Rafferty (155). Kunselman had a pair of first period falls for the title, with the final match against Ridgway’s Eric Gustafson. Brown also had the same road as Kunselman with two pins in the first period. He pinned Coudersport’s Dalton Miller in the championship. Rafferty put together a first period pin in the quarterfinals before getting a decision in the semis. He then pinned Curwensville’s Duane Brady for the title at 155 pounds. Redbank Valley also picked up a pair of champions in Kristopher Shaffer (130) and Ray Shreckengost (185). Shaffer pinned his way to the championship in three matches, while Shreckengost earned two pins in the tournament. Johnsonburg also had two champions in Kaden Dennis (115) and Aidan Zimmerman (138). Dennis had a fall, a major decision and a decision on his way to the title, while Zimmerman picked up three pins for the championship. Also picking up championships from the area were Curwensville’s Damian Brady (75) and Clarion’s Owen Reinsel (90). Also earning titles on the day were Port Allegany’s Dayton Sherwood (80), Chase Weimer (85), and Ian Dynda (100), Kane’s Harley Morris (110), Dakota Neal (210) and Shawn Nystrom (250), and Coudersport’s Dylan Hajzus (165). Brookville’s Andy Viglione and Brockway’s Eric Lunger tied for the District 9 Junior High Wrestling Coach of the Year.